Remember this Pure Beauty brand which i blogged about last month ? 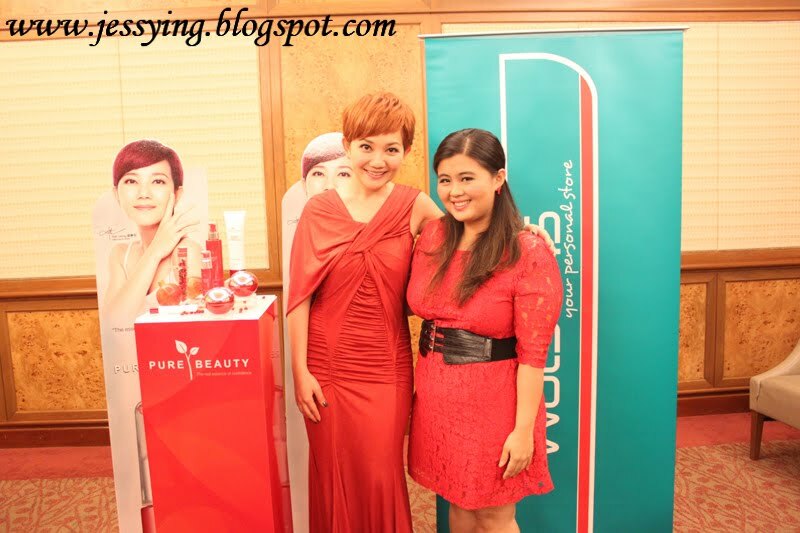 Well early this month I had an exclusive face-to-face interview with Fish Leong, the brand ambassador of Pure Beauty together with another 4 bloggers. Fish Leong was the Asia’s Queen of Ballads and has won the most honours in the music industry as a Malaysian singer. It was a golden opportunity for me ... I first listened to her to her songs 10 years and I learned how to sing it by memorizing it! It was a private & exclusive event held at Sunway Resort & Spa Hotel on 1st October. It turned out to be a warm and relaxing chat session with her. Q: How long has you been using Pure Beauty Pomegranate Antioxidant Skincare Range? Fish Leong : 2 months plus , which is since I was appointed as their ambassador. Q: Why do you choose to be Pure Beauty Ambasaddor ? Fish Leong : Because it is all made from natural ingredients and has the anti-oxidant range which is not very common in the market. Q: What is your favourite Pure Beauty's product and why? Fish Leong : I love Pomegranate Antioxidant Essence because it gives me a smooth feeling like doing a mask...it provides good hydration and my makeup stay on well the next morning. Q:Do you do facial very often? Fish Leong : No , because if you have good skincare regime, facial is not necessary. I massage by pressing the lymphatic nods and massage my face upwards for lifting purposes. Q: How do you still look good despite late night of recording and etc? Fish Leong : I have good skincare regime, drink lots of water, exercise regularly and take supplements such as Vit B and C. I take manuka honey to soothe my throat just before my concert. Q: Any beauty tips for our readers ? Fish Leong : Try not to take cold drinks it is not good for the body. Always try to drink home made tonic soup and take food which is high in omega 3 (such as cod fish and salmon fish). I sometimes make healthy breakfast for myself where I mix oat,banana,milk and maple syrup and all these is good for our body. Q: Why do you name yourself Fish ? Fish Leong : My Chinese name (Cantonese pronunciation) of my name is Ah yu and when I first started an ICQ account I think Fish is an easier name to remember. So I have been using this name FISH from then . 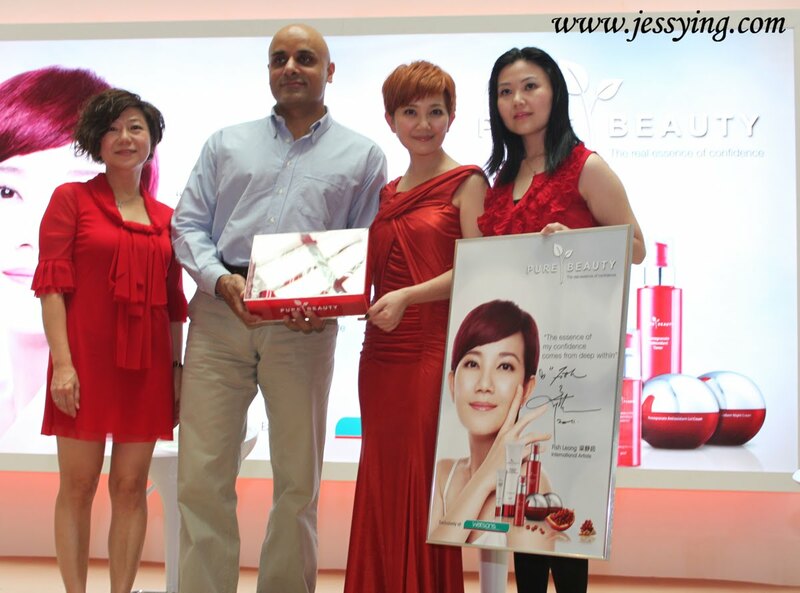 Fish Leong posting with Pure Beauty Pomegranate Antioxidant Skincare range. And we are very lucky to meet her as she will be in Malaysia for one day only for this event. After the interview, Fish Leong proceeded to Sunway shopping mall concourse area to make public appearance. This girl is so lucky, she won the Sing like Fish Leong's contest and get to sing alongside with Fish Leong! Must be one of the never forget moment she has there! Other than that, every purchase entitle you to get a signature of her name ! Another picture of Fish Leong with her backdrop. Me and Fish Leong - like her smile and her being humble despite her fame. Never thought of meeting and knowing Fish Leong through blogging! Love the fact that Fish Leong has a very warm smile and friendly. I could see that she has very good skin. I was sitting next to her during the interview session and I could see her skin is flawless and that she still looked gorgeous even though she applied light makeup only. And she told me she all this thanks to Pure Beauty! I also want to look like that when I am her age too, so definitely will be trying out Pure Beauty products! 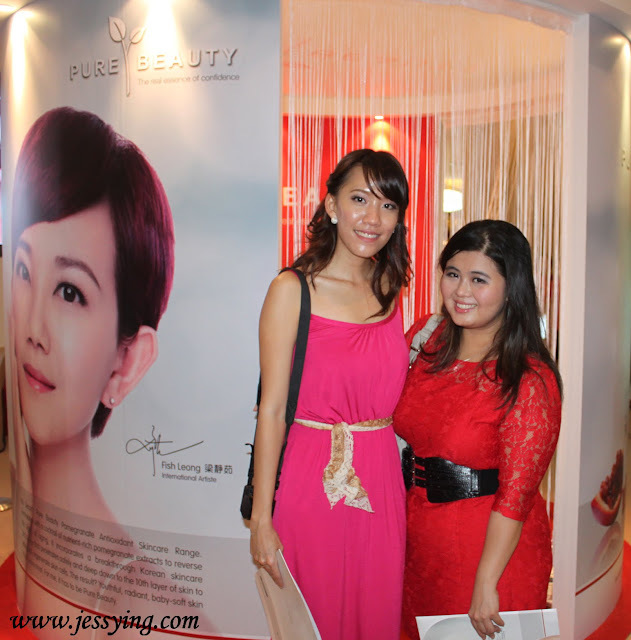 Thanks to Pure Beauty for this exclusive interview with Fish Leong :) Hope you guys enjoy this post as much as I do ! Pure Beauty is a brand which will be exclusively sold at Watsons nationwide. Wow, that's a great opportunity! Her skin really looks amazing, and she just looks gorgeous overall. :) Looks like you had a good time there too, hehe. Fish looks gorgeous in the photos. Nice writeup! Wow, u are so lucky to meet super star!